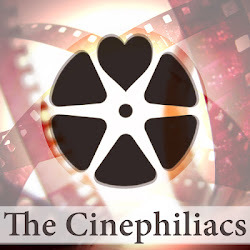 WARNING: Like my review for Cabin in the Woods, I plan on discussing Prometheus in full, without any consideration for what are considered “spoilers” If you are curious to see the film, just go see it. My opinion of whether I liked it or not shouldn’t be the factor. 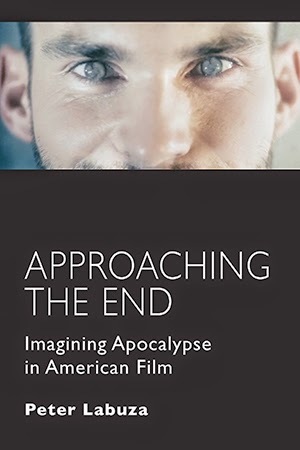 If you are curious to read on why I think the film functions as it does, without any consideration for hiding the aspects of the narrative, then read on. Also, I’m also going to spoil Lost. In 2010, the hit ABC series Lost came to an end with what many considered a crashing thud. For six seasons, audiences watched a show about constantly accumulating mysteries on an island. Lost fed its hungry fans with more and more—polar bears in jungles, buttons that saved the universe, alternate timelines—and then abandoned it all for a spiritual sit down with its characters, discarding the main reason that it originally drew viewers. For months before the finale, showrunners Damon Lindelof and Carlton Cuse warned their fans: “true fans” only care about their characters; the mysteries were irrelevant. Why this long primer on Lost, when the film of the week, and for many their most anticipated film of the summer, is a prequel to Alien? Because as much as critics will be discussing the craft of director Ridley Scott, Prometheus is assuredly a Damon Lindelof work. His hands are all over this film about a group of scientists traveling to a mysterious planet to find the origins of life. And in many ways, the faults of Prometheus lie in his blame (though Scott shouldn’t escape all the blame). Prometheus, as its mythical title connotes, is not some average blockbuster, or even simply an entertaining one along the lines of The Avengers. It’s ambitions—both in terms of its goals as a film as well as philosophically—couldn’t be higher. So one must give credit when one swings for the fences, only to strike out. The film begins with a bizarre sequence as an alien humanoid drinks a cup of mysterious liquid, only to die (this sequence goes strangely unexplained, and it is not the last). We’re soon aboard the spaceship Prometheus, a foreboding creature aligned with corridors of green and blue tints, running silently through the galaxy. Scott, shooting in a mixture of practical sets and 3D technology, gives the ship both a sense of comfort as well as menace. But while the crew sleeps, a man walks the corridors, or something pretending to be man. In the type of role made iconic by Ian Holm and Lance Hendrickson, Michael Fassbender (sporting a blonde head of hair modeled off of Lawrence of Arabia) plays David, the ships resident android. It’s probably not a coincidence that David shares a name with another human android, that of Spielberg’s Artificial Intelligence. Both yearn for something more than this world offers them, something their creators have denied them. But while Spielberg’s David is the protagonist of his tragedy, Scott and Lindelof’s David is merely ancillary, bringing up issues of identity, but never actually exploring them. Instead, our heroine (this is Alien, after all, even without Sigourney) is the messy haired Elizabeth Shaw, played by former Girl With the Dragon Tattoo (Swedish edition) star, Noomi Rapace. Elizabeth, along with her fellow scientist in training Charlie (Logan Marshall-Green), have traveled to the deep corners of space to find the origin of life, funded by a mysterious (and apparently dead) entrepreneur. But with Vickers, a stern and angry captain (Charlize Theron), and Janek, a wise cracking pilot (a very game Idris Elba, playing a variation on Stringer Bell), also on heading to a planet filled with danger, death is an inevitability. What would, or should, a prequel to Alien look like, or feel like? Each director—Scott, James Cameron, David Fincher, even Jean-Pierre Jeunet—has left a distinct style on their take on the unstoppable creatures. Instead of repeating the vast darkness and claustrophobic nature of Alien, Scott has created a world built on openness, and discovery. Much of Prometheus is supposed to be about the awe factor—expansive helicopter shots revealing the latest in technical wizardry (unlike Michael Bay, Scott at least shows off his effects so we can see them) in 3D, giving the film “spatial depth” (like most 3D films, it never factored in for me). 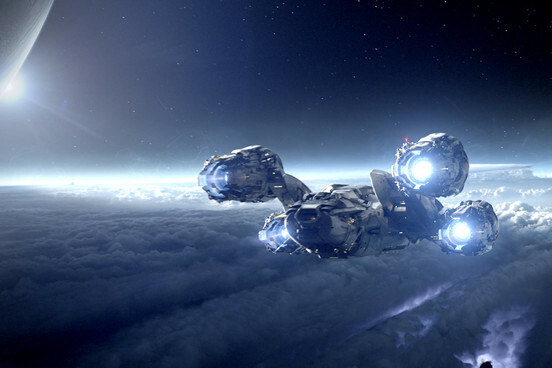 So why does Prometheus never feel like something new and fresh and exciting? Part is because we’re never sure what to focus on in Prometheus, as Lindenlof’s script (based on his rewrite from one by Jon Spaiths) jumps from plot line to plot line, without any consequence toward each other. David poisons Charlie with an organic ooze, though his motivation for doing so is never once explained. Janek and Vickers have a one-night stand, which only happens in order to set up a death sequence for two others. A character’s reanimation and murderous rampage goes undiscussed. And even the film’s bravura sequences—a machine-aided alien abortion that feels like a scene out of early Cronenberg and had me squirming in my seats—doesn’t even seem to register on anyone’s radar after it’s over. 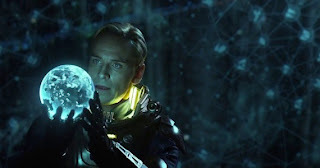 Characters in Prometheus often repeat lines about the importance of finding the answers to everything, but Lindenlof seems surprisingly stern against answering much of anything. 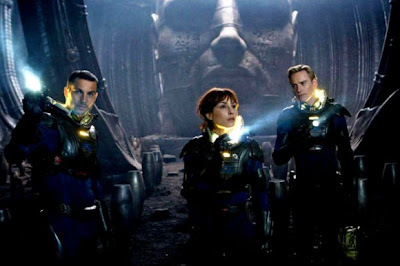 In many ways, the themes and textures of Prometheus feel like a response to Lost fanboyism. The film constantly poses questions and mysteries, but refuses to answer them. And Scott seems helpless to do anything to fight the script. There’s nothing wrong with giving a film having a great whatizit to quote Kiss Me Deadly, but Prometheus seems obsessed with these central mysteries (many of them that, to pay fan service, are Easter eggs for diehard Alien fans). It wouldn’t hurt if we understood more about Elizabeth or Vickers or David (all who have daddy issues, another popular Lost trope the film leans on) and their motivations. But their main motivation is to know, and Lindenlof’s hell bent desire to punish those who would want full answers to why they are watching this film seems misguided. Such scripting issues could be somewhat overlooked if Scott himself brought a fascination to his visuals, which are at least pretty. But Prometheus’s tone never captures that sense of both fascination and horror that defined Alien so long ago. The whole thing, with its Inception-styled score of bland tones by Marc Steinfeld, seems rushed, constantly moving toward something new without ever slowing down or considering its narrative. Even the film’s final sequence—a somewhat similar showdown to Alien’s iconic “Lucky Star” sequence—is rushed to the point where the film’s tension is only held for a single beat before climaxing. If anything, Prometheus shows how Scott has devolved over the decades (though looking over the last decade—Kingdom of Heaven, Body of Lies, Gladiator, A Good Year—may have been warning signs). The topper is the film’s final beat, in which the special effects team goes nuts as it finally shows the birth of the original film’s titular creature. It makes the Marvel post-credit sequences feel subtle in their execution. What is most offensive about Prometheus is its potential. An iconic franchise, a cast made up of highly regarded thespians, a bold and visionary premise, and a director who was determined to return to his roots. Where did Prometheus go so wrong? There’s so many great threads running underneath—philosophical, psychosexual, even technical—but none of it seems to register. And Lindenlof, who seems like the truer architect of this film than Scott, doesn’t seem to particularly care. If you don’t like his vision, then you aren’t a true fan. Of course, Prometheus is ultimately about the danger of asking big questions, so I’m done asking where the hell this movie went wrong.